There Are Good Reasons To Choose High-End Cabinets For Your Kitchen! When designing your kitchen, it is a good idea to start with the cabinets. They are not only the most dominant element in the kitchen; they also help to bring the entire design together. Cabinets usually take long to access and starting your shopping early will help to ensure that you have them when it is time for the installation. When shopping for cabinets, you will realize that they are available in a wide variety, from hardwoods and laminates to veneers and lacquered finishes. There are hundreds of styles, sizes, and configurations, and you can get exactly what you need for your kitchen. You can find anything from cheap ready-to-assemble cabinets to high-end cabinets that are substantially more costly. If you are wondering how to choose the right cabinets for your kitchen, the place to start is your budget. Determine what you can afford and look at the models available. Look at the different floor models and consider how the different options work with your style needs. When researching cabinets, you will find that high-end products come with a higher price tag and they are usually of a much better quality. There are good reasons to choose high-end cabinets, the best reason being the durability factor. You can source for cabinets based on the manufacturer and you can find that one company offers different models at different prices. The pricing and quality differs with options to suit different budgets. It is important to remember that investing in quality is more cost effective in the long run. The fact that you will not need to keep replacing the cabinets is an advantage. If looking through home decoration magazines has left you desiring European cabinets, you are not alone. There are several European manufacturers that stock beautiful cabinets that can help to complement any home. Manufacturers like SieMatic, Allmilmo, and Poggenpohl, offer beautiful cabinets that are designed for the high-end kitchen. Depending on the cabinets that you choose, you should be prepared to dig deep into your wallet and be prepared to wait a couple of weeks for your order. If you have a less sizable budget, find out what the manufacturers have on offer within your budget. There are some good reasons to get custom cabinets, the best reason being the uniqueness factor. You can create a highly individualized kitchen that is designed using imported custom cabinets. The cabinets you order can be modified to suit your needs or you can get special cabinets from the wide range of sizes and finishes. Some of the surfaces available include wood veneers, laminates, and lacquer finishes, as well as hardwoods like spruce, maple, beech and mahogany. SieMatic offers lines made in Canada and Germany and you can get cabinets to suit any style needs. When it comes to quality, production cabinets offer the consistency that is not always possible with handmade cabinets. The best cabinets are manufactured with exacting tolerances to ensure high quality. The advanced equipment used in modern cabinet manufacturing helps to ensure that the quality of work is excellent. A good reason to invest in high-quality stock cabinets is that you can inspect the quality of the work before you buy the product. This is not always possible when you order custom-made cabinets. Watch out for heavily discounted cabinets as they may be made of low-quality woods. 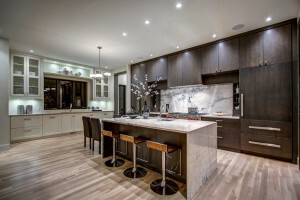 When choosing cabinets for your kitchen, size is one of the most important factors. Most major manufacturers offer cabinets in different widths that can range widely depending on their location or installation spot. Look at various models on offer so that you can choose the ones that suit your needs. Measuring your kitchen space will help you to make the best purchase decision. You can usually get trim panels to cover gaps between the cabinets and the ceiling or walls and they are cut to fit the adjoining surfaces precisely. If your kitchen design is unusual, a little creativity will get you what you need. Most cabinet manufacturers offer some modifications at an additional cost. If you want to increase or reduce the cabinet depths or to install roll-out shelves, breadboards, door attachments and other changes, you can get the work done. You can have your stock cabinets upgraded with leaded-glass doors or oak-lined interiors. You can also order special pull-outs and other features. There are manufacturers that build special one-of-a-kind cabinets to suit the discerning customer who has the budget for it. Talk to your kitchen designer about the availability of specialty accessories. When choosing cabinets, make sure that you consider the hardware. The cabinet knobs, hinges, pulls and other accessories will not only help to enhance the appearance, they also improve efficiency and ease of use. Choosing the right cabinet hardware will make your cabinets more functional and you can make the best use of every bit of storage space. 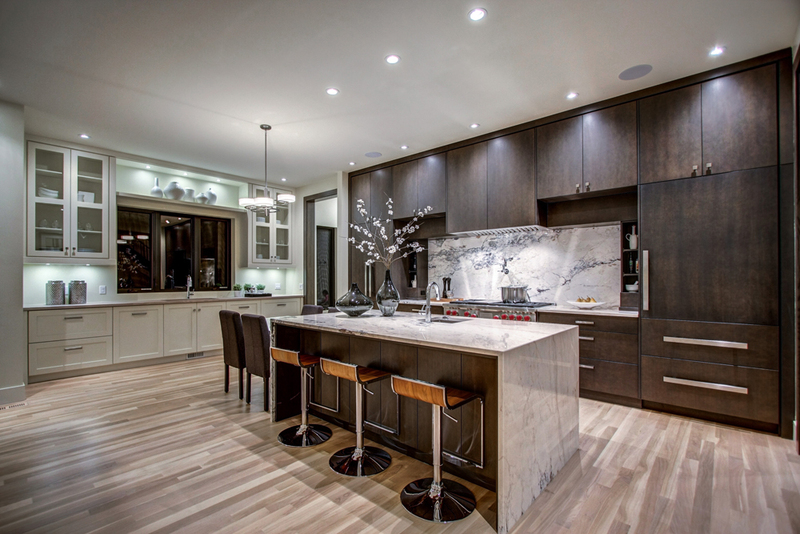 Remember that, no matter what design or style that your kitchen needs, Bow Valley Kitchens in Calgary and Canmore are here to help, come visit our showroom today to get started.